Make ahead marinated red onions is a healthy recipe that's also super easy. 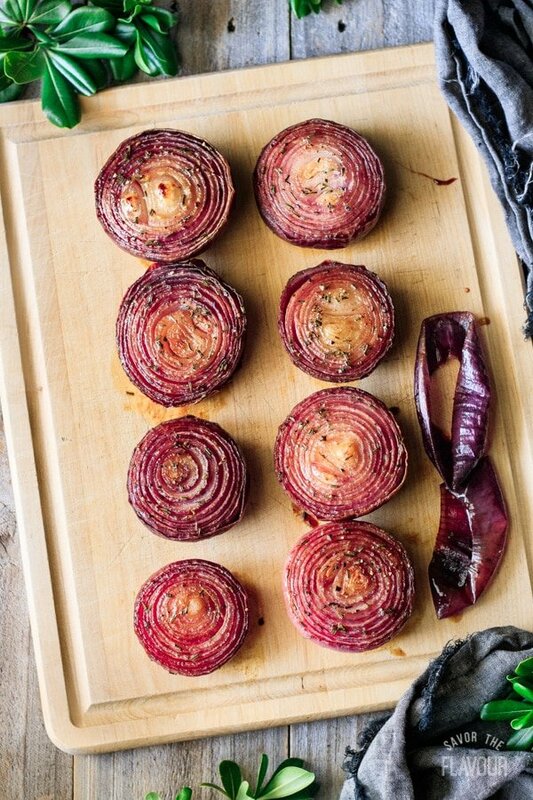 The red onions are marinated in balsamic vinegar, brown sugar, and other seasonings, then roasted in the oven. This popular dish is low carb, gluten free, and has many health benefits. Just start this simple side dish the night before your next potluck, family gathering, or holiday meal. This recipe was originally published on January 5, 2018. Make ahead marinated red onions are simple to make, and look elegant when served on a fancy platter. The secret ingredient is time, so make sure to allow enough time for the onions to marinate overnight. Are marinated red onions good for you? Compared to other onions, red onions are the highest in antioxidant compounds. Fermented vegetables have probiotics, which helps maintain a healthy gut. 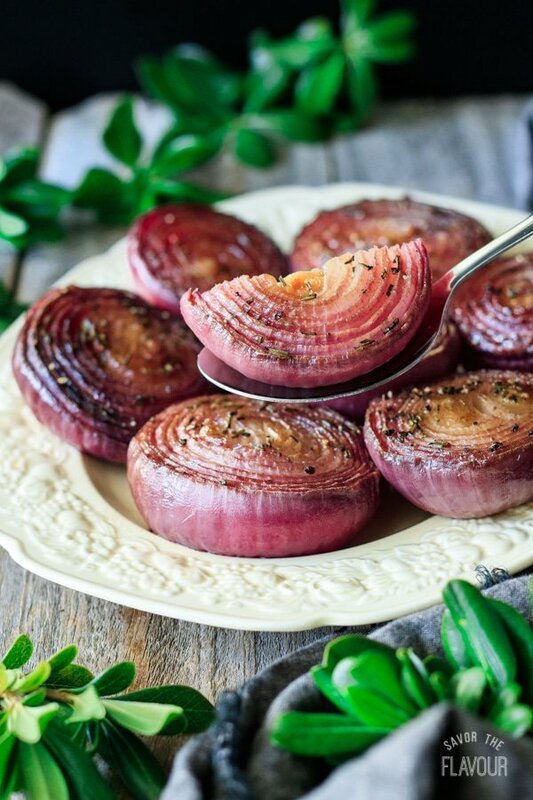 Red onions have anti-inflamatory properties due to the flavonoid quercetin. They are high in fiber, folic acid, and vitamin B. How do you cut onions without tears? Use a sharp knife. This will give you a cleaner cut so it will cause less damage to the cell wall which will produce less chemicals in the air. Chill the onion in the fridge or briefly in the freezer before slicing. It will retard the release of the sulfuric compounds. Run a vent hood and slice near it. It will take the fumes away from your eyes and bring them outside. This tasty marinade comes together super fast, and the onions prep in a flash. Really, what’s not to like? Experience something new, and give it a try this week. Find all your ingredients then measure out the two vinegars, spices, brown sugar, and butter. Use a sharp knife to cut off both ends of each red onion then slice the onion in half. To help ease the tears, read my suggestions above. Keep the outer skin on, as it helps the onions keep their shape. 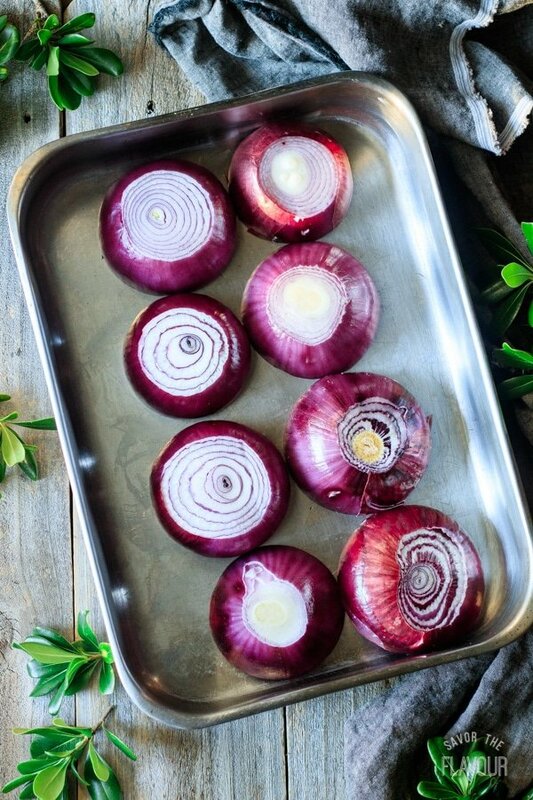 Place the red onions with the largest cut side down in a large baking pan with sides. 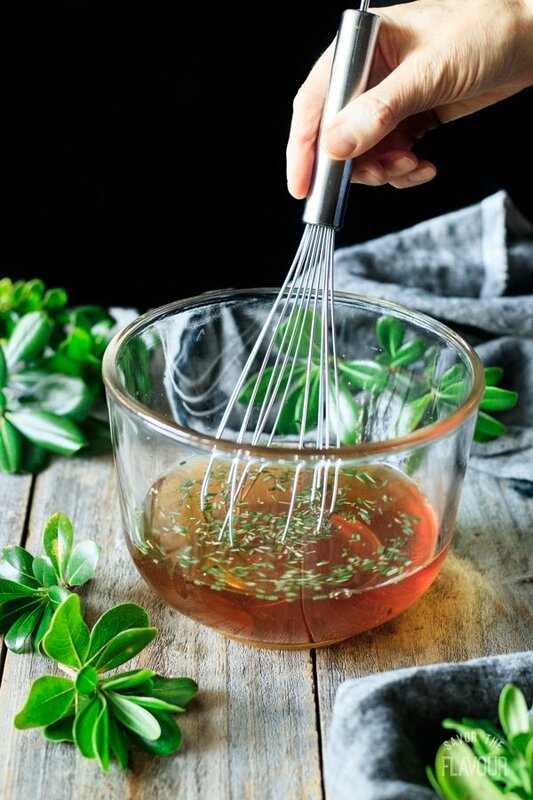 Make the marinade by placing all the ingredients in a bowl. Pour the marinade over the red onions. 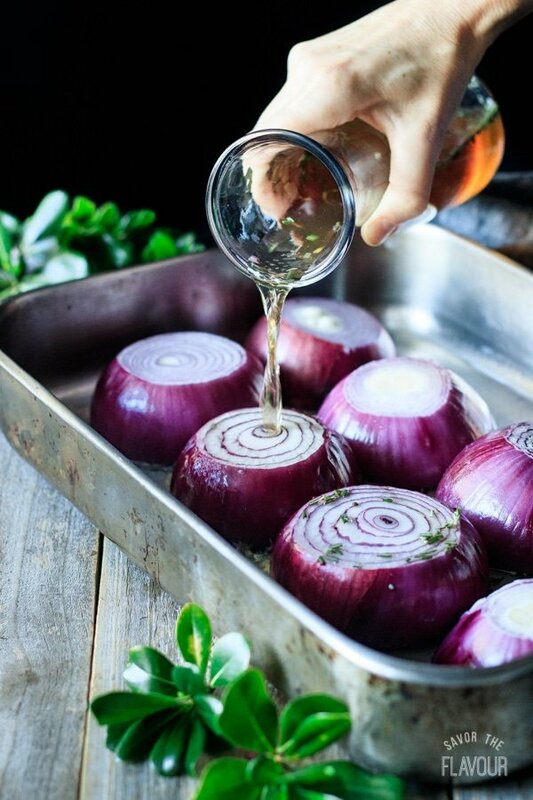 If you want, sprinkle more fresh rosemary over the cut ends of the red onion. Cover with foil and refrigerate for at least 12 hours. Cook the red onions uncovered at 400 F for 30 minutes. Flip each onion over and put a pat of butter on top. Sprinkle more fresh rosemary and a few grinds of black pepper on top of the onions. Put back in the oven and bake for 15 minutes more. Take the red onions out and baste the onions with the marinade using a large spoon. Put back in the oven for another 15 minutes of cooking, baste again, then repeat this process once more. Before serving, remove the tough outer skin. Pour the warm marinade in a small bowl. Serve hot on a fancy platter with hot the marinade on the side. 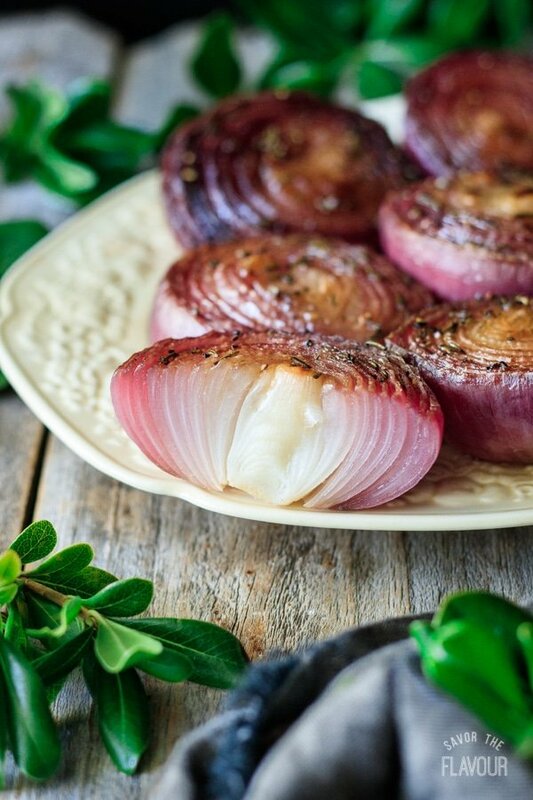 Your guests then can spoon more delicious marinade over their onions to intensify the flavor. Make this the night before to give time for the onions to marinade for maximum flavor. Keep the onion skins on while baking to help keep their shape. Just remove them before eating. Need to substitute an ingredient in the marinade? 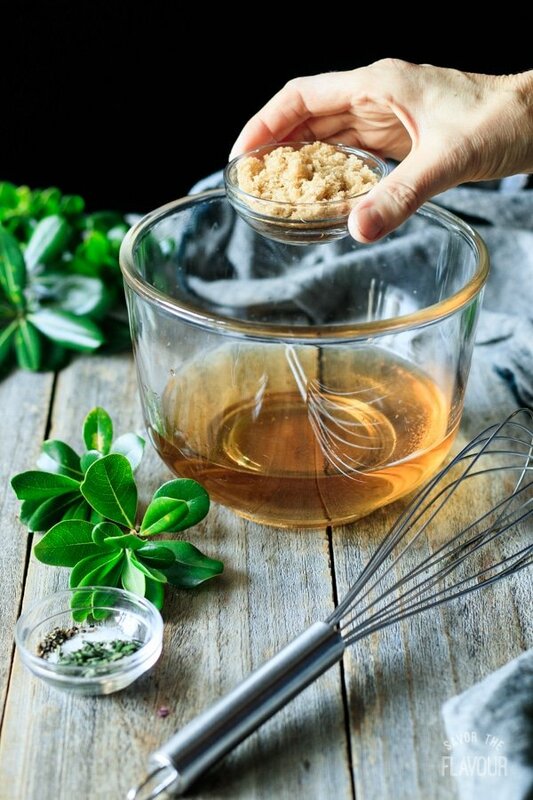 The basic ingredients are water, vinegar, sweetener, and spices. Looking for a sugar substitute? Try honey, maple syrup, or rice malt syrup. Don’t have fresh rosemary? Switch out with another earthy spice like thyme or oregano. 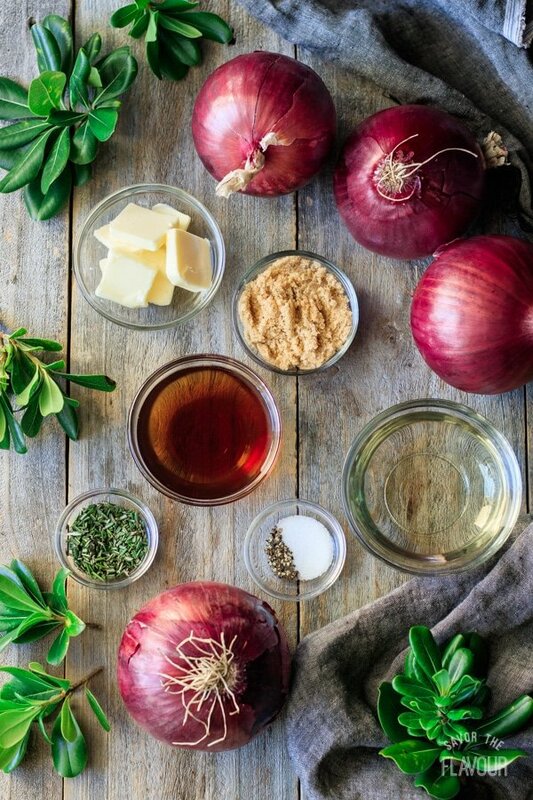 The marinade makes the onions more flavorful and easier to digest. 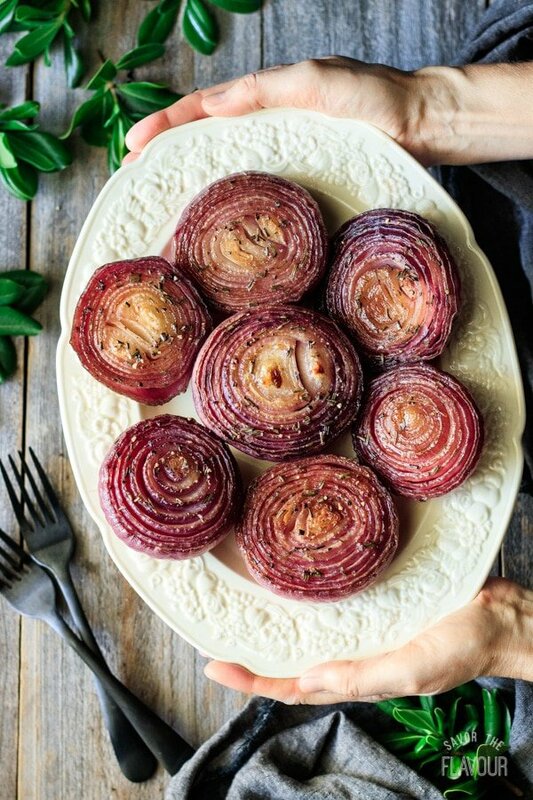 For best flavor, marinate and roast the onions with the flat side down in the marinade, and then turn them over half way through. Tempted to skip the basting? This is an important part of increasing the flavor of the dish. Don’t throw the marinade out; keep it for guests to spoon over their marinated red onions. This recipe is a huge hit with my three girls. 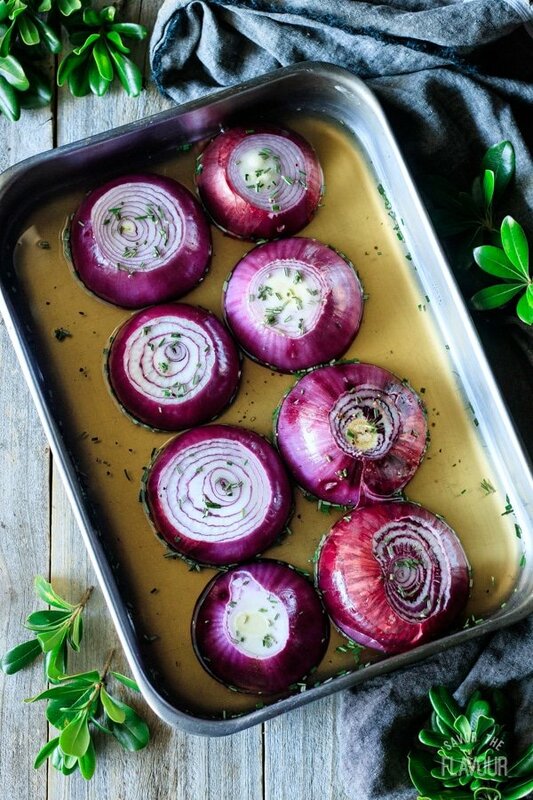 Honestly, who doesn’t love the smell of onions roasting in the oven on a cold winter day? 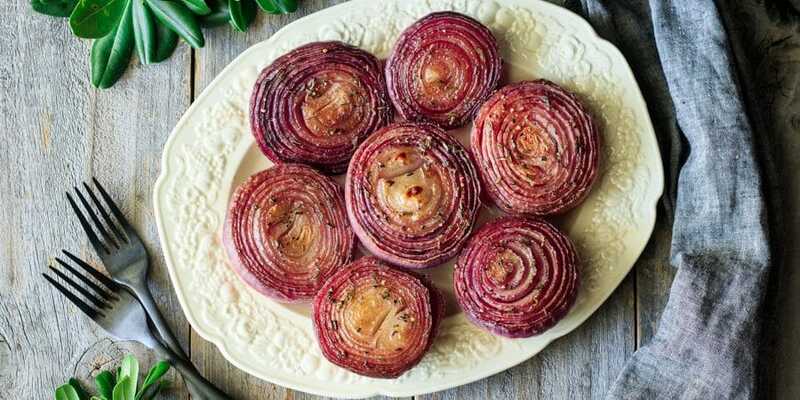 Enjoy onions with these delicious recipes. Simple Caramelized Onion Dip Recipe: a make ahead dip recipe that’s addictively creamy and onion-y. 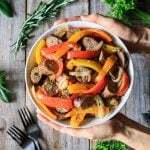 Italian Sausage, Peppers, and Onions: this colorful, low carb dinner recipe is ready to eat in just 1 hour. Onion, Thyme, & Goat Cheese Tart: a gourmet, vegetarian appetizer that looks quite impressive. 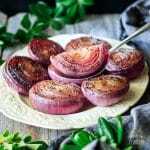 Did you make these marinated red onions? Please leave a star rating below the recipe to share how you enjoyed it. Make ahead marinated red onions is a healthy recipe that’s also super easy. 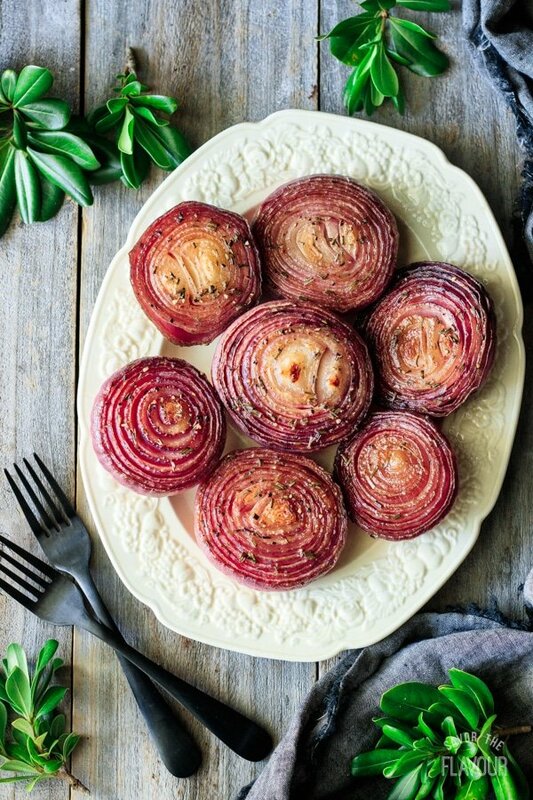 The red onions are marinated in balsamic vinegar, brown sugar, and other seasonings, then roasted in the oven. This popular dish is low carb, gluten free, and has many health benefits. Just start this simple side dish the night before your next potluck, family gathering, or holiday meal. Cut the ends off the red onions, then halve them. Keep the skins on, as it helps the onions keep their shape. 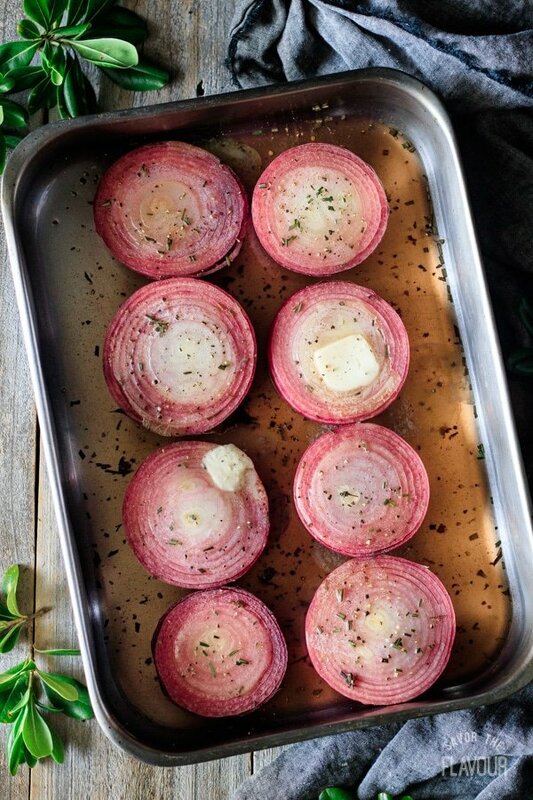 Place the onions flat side down in a baking pan with sides. Whisk together the water, vinegars, brown sugar, and spices, and then pour over the onions. Cover with foil and allow to marinate for a minimum of 12 hours. Cook uncovered at 400 F for 30 minutes. Flip each onion over, put a pat of butter on top of each onion, sprinkle the rosemary and a few grinds of black pepper on top. Cook for 15 minutes more, then take out the pan and baste the onions with the marinade. Repeat this step two more times. Remove the tough outer skins, then serve warm on a pretty platter. 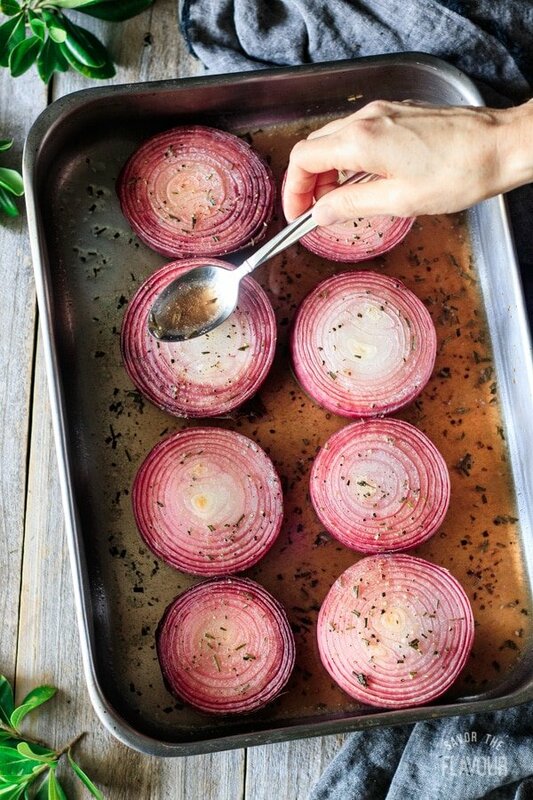 Pour any leftover marinade from the baking pan into a small bowl and serve with the onions. This is best made the night before you want to cook it. The prep time is minimal, but the chilling time of 12 hours is necessary for maximum flavor.